After putting it down to start and finish numerous other projects, I finally finished my Signature (without the) Stripes! My project page says it took me two months, but it was obviously not two months of actually working on it. I knit several other things during that time. Obviously, I omitted the stripes! I knit each sleeve for an extra three inches, which turned out to be the perfect length. I seamed the shoulders before picking up stitches for the neck (the pattern didn’t specify when to seam them). If I knit this again, I might modify to do a three-needle bind-off at the shoulders instead of binding off as written. 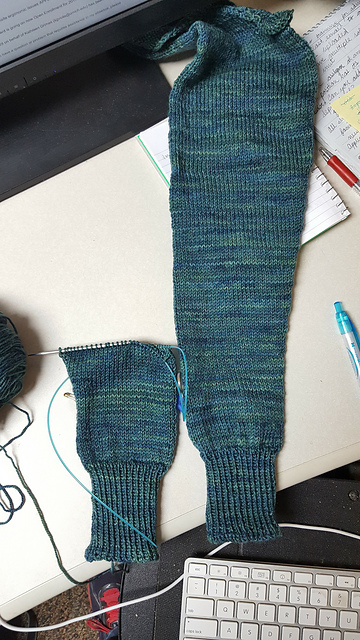 My row gauge was bigger than the pattern row gauge, so the fronts took fewer rows. When picking up for the neck, I picked up 48 sts along the left front and 44 along the right front. I decreased 4 stitches evenly spaced along the left on the next round. I knit the body to pattern, but it is too short for my taste. The bathroom FO photo is pre-blocking; I am going to see if I can stretch the length when I block. After taking literally weeks to knit the first sleeve (I got very bored and knit a million other things, as seen above), I finally got serious about finishing and banged out the second sleeve in two days. I alternated skeins for the entire body and one sleeve. I did not alternate for the second sleeve and I can’t even tell which sleeve that was. I’m very impressed with SweetGeorgia based on this project. This was my first time using their yarn and it was definitely a good experience. This was also my first time knitting set-in sleeves. The seaming was easier than I expected (I used mattress stitch) and I really like the fit at my shoulders. In my tradition of late-night FOs, I finished the seaming at about 12:30 Thursday night. 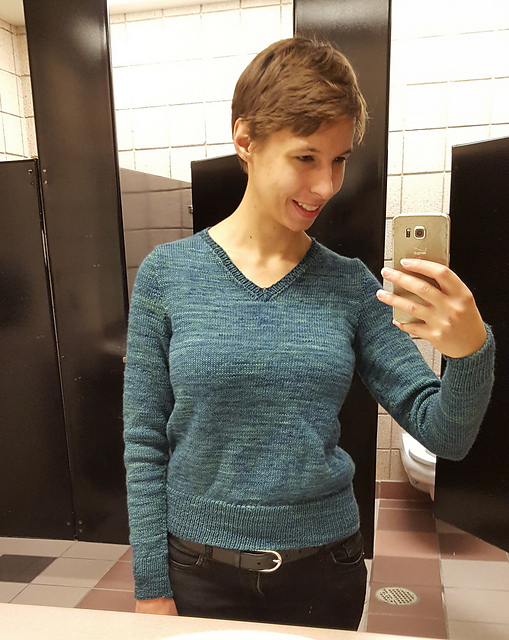 I wove in the ends the next morning and wore the sweater to work! Overall, I’m really happy with this sweater! I think it has a really classic fit and I’m sure it’ll be a new go-to for me. I’m not usually a v-neck person, but I decided to try something new with this, and I definitely like it. Work bathroom shot, best shot.